The greatest magic trick of gratifying your inner self is telling the truth when everyone expects you to lie. True be told, parenting is a blessing, but it comes with its challenges. When you are not breastfeeding the little one, you are doing the laundry, if not the laundry, you are preparing the next meal for your family. And before you know it’s already bedtime. This vicious circle can take a toll on you leaving little or no downtime as a parent. A ponytailed hairstyle, a long Tesco branded T-shirt with misplaced hem, and humongous college day’s pajama turn into the order of the day. You have to trade-off everything for the comfort of your kid. But come on! That unkempt pony-tailed needs to relax sometimes, the Tesco branded T-shirt deserve to burn in purgatory, the pajama?? It deserves a special corner in hell with neither WIFI- nor a charger! How is that even possible you may ask? Like manna straight from heaven… a baby jumper. Shopping for one of the best baby jumpers in the market could be the missing link between your spouse lamenting words like, “You look hot honey” and not being so fortunate. Don’t get it twisted. A baby jumper is not a leeway to escaping parental responsibilities. Much as you need to take that devious makeup or shower, you need to create a bond with your baby. After all, it’s easier to mend broken kids than repair fully bearded and tattooed grownups. Baby jumpers are suitable from birth to approximately 12 months. These simple baby chairs keep your little one secure and bounce naturally. Others are sleeker as they are mounted with toys, and inbuilt vibrations and motions. Not sure about which one to choose? These accessories are not one-size-fits-all, have a look at the ten best models that we would recommend. We have grouped them into categories of Doorway Jumpers, Stationary Jumpers, and Stationary Activity Jumpers. Looking for a doorway jumper? Think no further as the Graco Doorway Bumper Jumper will come in handy. It is great cute rocker that your little one will love. It comes with a spring loaded clamp which can be easily installed on the doorway. This ensures prolonged unmetered rocking sessions. This clamp does not leave dents on your doors leaving them sparkling clean. The seat pad comes with a removable cushion that can be washed. This makes it possible for your baby to enjoy a clean playing and napping environments. Additionally, the seat is relaxed for your child to have a comfortable time while jumping up and down. The Graco Doorway Bumper Jumper, Little Jungle comes with a toy tray. On this tray, the two detachable toys can be removed when your little one is not in the mood of playing or is asleep. Playtime has never been this easier as these toys interactive as they play rings. For a simple in and out into the rocker, the Graco Doorway Bumper Jumper has a dome shape that is wide enough compounded by non-twist straps. At the bottom, the legs section is sufficiently wide to accommodate even relatively large kids without hurting their private parts. Lastly, it comes with an easy to adjust strap than can be adapted to accommodate the legs. It takes less than 10 seconds to synchronize their height with that of the rocker If your kid has grown taller. It is also small making it possible to travel with. The only possible downside is the spring which is a bit stiff to allow prolonged rocking. The foot slide has a tendency to slip on the floor surfaces like tiles. Not ideal for wide doorways. If you are looking for an affordable way to entertain your newly born at the same time help them develop motor skills the Graco Doorway Bumper Jumper is your best wingman. It is safe, plays engaging music, and the strap can be adjusted accordingly. It may have taken you years to settle on a baby jumper, but Evenflo ExerSaucer Door Jumper, Bumbly is the deal maker. This baby jumper is a simple yet a perfect plaything. With the Evenflo ExerSaucer Door Jumper, your baby falling without consent is not negotiable. It is fitted with door frame clamp that firmly holds in place the jumper by clenching on frames of up to 6-inches thickness. You will go on with your business without having to worry whether it will snap. 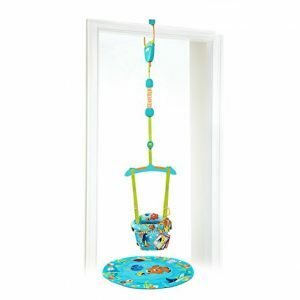 The Evenflo ExerSaucer Door Jumper, Bumbly has a cartoonish design and is garnished with cool toys dangling around. Developed in collaboration with Child Development Institute, this baby accessory can be adjusted in terms of height, so it grows with your baby, it also has a soft landing base. The seat has a washable cushion that can be cleaned in a washing machine whenever your baby messes it with the spills. The flexible spring is sufficiently covered to prevent it from nipping your kid’s fingers. Additionally, it stretches without strain allowing for smooth jumps that help in muscles development and motor skills development. The few toys possibly make it less interesting to the babies. In conclusion, Evenflo ExerSaucer Door Jumper is the best value for money hands down. The adjustable strap is unequivocal, has a large playing compartment, and the sturdy design is some of the attributes that earn this device a spot in this lineup. Whether your baby cries a lot or not, the Sassy Inspire the Senses Doorway Jumper Is their balm. It comes with clean, bright, and entertaining colors to synchronize with your little one temperament. It also has six developmental toys that can be detached for extended play. Furthermore, it also incorporates a loop that allows you to extend the toys version or interchange them to avoid monotony. The Sassy Inspire Doorway Jumper can be attached to the door frame and securely locked with the locking mechanism keeping the jumper firmly in place. This compounded with a one of a kind spring mechanism gives a safe and secure bounce without shifting the goal posts on the safety of your baby. The Sassy Inspire Doorway Jumper can hold a maximum weight of 25lbs, so you don’t have to rein in on the food portions your kid eats, it also has different height adjustments that you can configure according to the progress of the cute holidaymaker. We know kids just have a way of messing anything clean they come across and the Sassy Inspire the Senses Doorway Jumper is not an exception. However, the manufacturer had this in mind as the seat cover can be removed, and machine washed making the jumper as clean as new. If the baby jumps too much they can bump their face or head so you have to keep checking on them. The Sassy Inspire the Senses jumper is a perfect way to entertain your baby. It is a portable accessory, colorful in design, and super bright. These positive attributes will guarantee your baby an everyday smile. When confronted with the dilemma of buying a baby jumper, any parent will admit that style and safety come first. Luckily the Bright Starts Sweet Safari Bounce-a-Round Activity Center incorporates these two features. The sturdy frame with non-slick rubber legs firmly grips on the floor ensuring that your baby remains in the same position without moving. Along with that, it also comes with a strong strap that gives that extra edge when it comes to safety. It is covered with a machine washable cover which reduces the murkiness that food spills causes at the same time making it look clean. If the cover gets soiled, just toss it in the washing machine with some detergent, and within no time your baby will be up and jumping again. Kids grow at an alarming rate, so does the Bright Starts Sweet Safari Bounce-a-Round Activity Center. It has three seat adjustments which can be adjusted according in consonance with the cute one’s height. When it comes to portability, this baby jumper has got you insured! It has a compact morphology at the same time lightweight. Looking to venture out with your baby has never been this easy. The Bright Starts Sweet Safari Bounce-a-Round Activity Center is not one of those really bouncy jumpers in the market. The spring is a bit stiff. 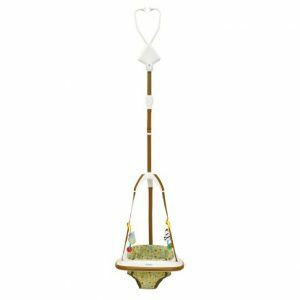 The Bright Starts Roaming Safari Door Jumper not only entertain your baby, but it also helps in promoting their grasp, and reach. Additionally, it will also support them until they reach 24lbs. And who knows they may just be crying once they realize that the bond will end at that stage. Creative Baby Eric Carle the Very Hungry Caterpillar Activity is perhaps the most versatile baby jumper in the market. As the names suggest, it is inspired by the very hungry caterpillar book. It’s an activity saucer for both the small sized and the much bigger counterparts. The jumper comes totally festooned out with multiple options for your toddler to enjoy. It has brilliantly colored toys, light-up station, 5 classical melodies, and a flipbook. The sturdy structure allows the Creative Baby Eric Carle to withstand even the highest of jumps without necessarily having to worry about your baby falling. That notwithstanding, the lightweight nature of this jumper makes it portable, and the folding attribute makes it easy to store without consuming humongous space. As far as the functionality is concerned, the Creative Baby Eric Carle has adjustable heights. This allows the jumper to grow with your baby. The luxurious and cozy seat is sufficiently padded and comes with a machine washable cover. It also arrives in a wide variety of colors which can be matched with the kid’s temperament. The only downside of this jumper is the height adjustment. Many parents registered their concerns saying that it had outgrown their child quicker than expected. If you are looking for a baby jumper that is packed with grow-with-me worth or value, the Creative Baby Eric Carle jumper is what you need. It has beautiful musical options, excellent height adjustment, and of course the sturdy structure. The Disney Baby Finding Nemo Jumper has successfully pushed the boundaries of baby rocking equipment when it comes to entertainment. It has 3 removable toys with the most outstanding one being the Nemo Bead Chaser and a small stuffed Dory. Inclusive in the entertainment package is the play mat that is placed under the kid’s feet to act as a shock absorber or a play mat on the floor. It firmly stays in place while hooked to the doorway frame courtesy of the sturdy clamp. The non-slick rubber gasket also makes sure that it does not leave conspicuous marks on the door frame. For that extra comfort and support, the Disney Baby Finding Nemo Sea Of Activities Door Jumper has a prop pillow for tummy support while playing with Nemo character. Additionally, the padded seat with a removable cover which can be washed makes sure the jumper maintains that sleek look and also doubles up as a storage bag. For safety purposes of your kid, the Disney Baby Finding Nemo Door Jumper has a secondary security strap. This added to adjustable strap makes sure that your baby will grow with the jumper without any safety issues coming up. Snapping of the toys and leaving sharp edges which can hurt the baby is the only possible thin ice. The Nemo baby jumper provides that magic bullet to keep your child secure and entertained giving you as the parent the much-needed break. It comes with a nice play mat, sturdy frame, and a removable seat cover. Parenting just went above cloud nine with this jumper. The most outstanding feature is the entertainment aspect of this accessory. Is has a cherry-zoo theme that will keep your baby occupied by music. You may be bringing up a nature lover as the jumper has lights and makes animal sounds. Such type of exposure is paramount at these early stages as it increases coordination. With the Fisher-Price Luv U Zoo Jumperoo jumping just got safer. This baby jumper is fabricated from strong steel that makes a sturdy structure. It is capable standing on its own and absorbing the shock emanating from the jumps. The magic goes further as it has non-slip footing which makes it stay in place without having to worry about tipping off. Fisher-Price Luv U Zoo Jumperoo is what in religion terms would be referred to as the Mecca of baby jumpers. The seat height can be manipulated into accommodating your child’s legs which imply that it grows together with the kid. It also has no commonality with bulkiness as it can be moved quickly. The solid configuration also makes it easy to store. The only downside is in the fact that it may not be ideal for extra large kids. 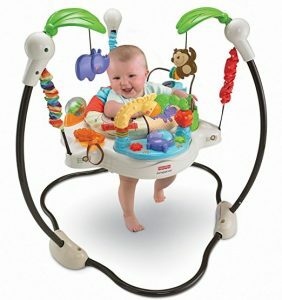 The Fisher-Price Luv U Zoo Jumperoo is a great product for your baby. This accessory is synonymous with the safety and quality that any parent would wish for their kid. It is the ultimate gift for your child to help them develop both physically and mentally. 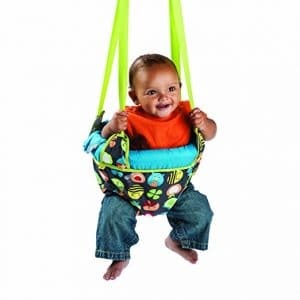 Jolly Jumper on a Stand for Rockers fits the mold of the top best baby rockers on the market. The versatility of this rocker is clearly visible in the walking/balance functionality and is a perfect match for kids in the pre-walking stage. The rocker provides back support and aid the baby to improve their balance without compromising on the ability to develop strong leg muscles. It comes with a sturdy frame that can hold up to 28lbs maximum weight and is conveniently portable. You don’t have to leave your baby behind with the nanny during the weekend as you can carry it almost everywhere creating a good bond with your child. The Jolly Jumper on a Stand for Rockers seat is fabricated to fit your baby like skin! It is made of comfortable material that does not hurt your baby nor make them scratchy. Additionally, it is scientifically designed to allow them to exercise unmetered from as early as 3 months. The Jolly Jumper on a Stand for Rockers has the best harness. It totally supports the baby especially the backbone allowing the muscles to develop without coercion. Moreover, it is springy which means injury free prolonged jumps. The fact that it comes on a stand means that it can be moved around without being limited to the door frame. You and the baby can site outside. This helps expose the child to different scenery outside the house. Many parents will like the fact that the clamp does not easily break. They also don’t have to worry about the older siblings shoving the young kid jumping accidentally. This is a rare phenomenon with the door jumpers. The only downside is the steep price tag compared to its peers. It also occupies a large space and needs sufficient space or a special spot in your house to set it up. Jolly Jumper on a Stand for Rockers is an excellent baby accessory that doesn’t have close competitors in the same price range. It is portable, easy to assemble, comfortable for your kid, have an adjustable height which translates into value for your Benjamin’s. 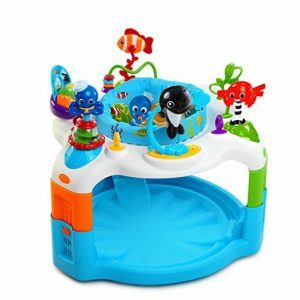 Baby Einstein Rhythm of The Reef Activity Saucer has been manufactured with the baby in mind. And for the parents who have white collar jobs can attest the convenience that 360 degrees bring while moving around the desk. 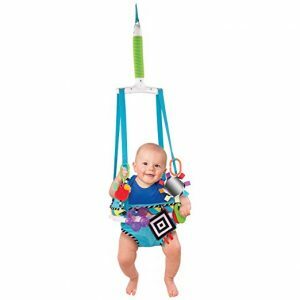 This baby jumper has a 360 degrees rotation which makes it possible to reach all the toys. 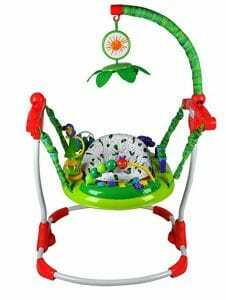 The Baby Einstein Rhythm of The Reef Activity Saucer seat is adorable. For that extra comfort and support, it is sufficiently supplied with soft padding material that gives the much needed extra support and comfort for the baby. The seat pad cover is easy to clean and dries easily. Your kid can never be too young to start learning a second or third language. The Baby Einstein Rhythm of The Reef Activity Saucer has English, French, Spanish settings. Lastly, the 5 height adjustment positions make it possible for Baby Einstein Rhythm of The Reef Activity Saucer to grow with the baby. That notwithstanding, this baby jumper lies flat when you want to store it in a beautifully crafted built-in storage tray. When not properly installed, the Baby Einstein Rhythm of The Reef Activity Saucer the piano keys become hard with a static sound. Baby Einstein Rhythm of The Reef Activity Saucer is one of the best baby companions you can ever purchase. It will keep the baby busy for you while they continue jumping, enjoying, and playing. Moreover, it is relaxing and safe. The Graco DuetSoothe Swing and Rocker, Winslet is a multitasking baby accessory. It has 2-in-1 function that includes a swing and a rocker. When your baby is super excited, they will dance their heart out with the smooth rocking. The rocking intensity can be adjusted to match the kids mood. Graco DuetSoothe Swing and Rocker, Winslet also has a super comfortable seat. This seat has three reclining positions which can swing and rock both front –to-back or side-to-side top keep the little one feeling as if the mother is rocking them. We all know that kids love to be cuddled. The seat is comfortably padded and has sufficient space to make the baby feel comfortable and warm. Because the little one will be spending a considerable amount of time on this rocker playing, messes are bound to happen. Relax as even when that diaper fails you, the seat pad is removable and machine washable. When you purchase the Graco DuetSoothe Swing and Rocker, not only are you getting a magical piece of baby accessory. You are also buying an entertainment haven. It comes with an in-built nature sounds and music to keep the baby entertained. Additionally, it has hooks which can be used to add more toys. The toys are interactive, and your baby is guaranteed of a smile. Safety is probably the biggest concern for any parent while using a baby jumper. However, with the Graco DuetSoothe Swing and Rocker your child is extremely safe. 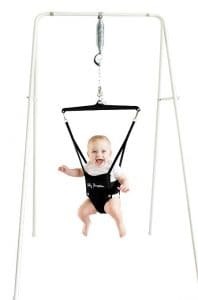 This baby jumper comes with a 5 point harness which is the highest possible threshold for any baby jumper in the market. The biggest reservation is the noise emanating from the motor when the jumper changes the rocking direction. 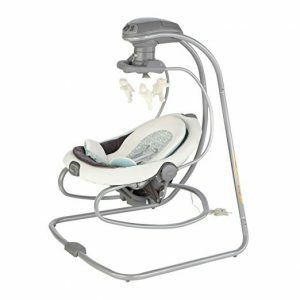 Generally the The Graco DuetSoothe Swing and Rocker is one of the best in the market. You will adore the patterns as this will hand your baby that much-needed caprice to their baby accessory collection. The interactive toys, multiple speed dials, 3 reclining positions are also among the other stand out features. If you live in a rented apartment this is godsend as it is easy to move around the house without consuming too much space. These types of baby jumpers are relatively big. If you are not looking to bridle your space, this will perfectly suit you. They are installed in a particular location of your house. They have an integrated which swing the baby but are exceptionally heavy. They have no entertainment features save for keeping the baby jumping from the suspended seat. They come fitted with a seat, elastic cord, and are fabricated from a sturdy frame. The most outstanding feature about the stationary activity jumpers is the fact that they come with toys. They also have a steep price tag. They are also commonly referred to as door jumpers. They come with suspended cables which can be clamped onto the doorway frame. Most of them don’t have toys to play with. All a baby does is sit down and wiggle all the day. For this reason, it is almost impossible to know what will excite them or put them off. However, before or even during shopping for the best baby jumper that suits your little one, there are some things you need to consider. The reason why the seat comes first is because this is where your baby will be spending most of their time. The best baby jumper is the one that has sufficient paddling. The right amount of cushioning ensures that they comfortably sit on the machine. Additionally, the cushion should be washable as babies can get messy with the spills. It would be lackadaisical not to consider the reclining positions of the seat. A safe seat should have various reclining positions to ensure that it does not hurt the baby’s back and also conforms to their age. Lastly, on the seat, you should settle for the one with a seat clip which ensures that the rocker is stable when not in motion. This is the supporting structure of the jumper. A metal frame is sturdy as opposed to the plastic ones which are prone to breakage hence can lead to unnecessary accidents. Additionally, depending on how long you intend to use the mouse and how often you need to move it, it should not be heavy. A kickass baby jumper comes with a broad base. A whole lot of things could go wrong with a narrow-based rocker and all the movement. Goes without saying, it should come with non-slide legs that firmly hold the floor not to slide. The rocking of these accessories is pegged entirely on the frame. A good frame should allow for protracted rocking without necessarily having to move it now and then. Safety of the baby jumper that is too hard to overlook. You don’t want your kid to grow up hating you as a result of letting them fall. The first safety feature is the seat restraint. Some jumper will come with 3 safety harness while other will come with 5. The more they are, the better. Weight capacity is another safety factor. Make sure you check the ideal maximum weight capacity. Once the kid outgrows the specified weight, it’s only sensible to let go of the swings. Whether sunny or rainy, you don’t want to face a dilemma on whether to go out with your kid. Who needs Vitamin D supplements while the sun can provide endless doses? A good baby jumper will come with a sunshade to ensure enough sunshine reaches your kid without getting those nasty sunburns. Babies can be so unpredictable, one minute they are cool calm and collected the next minute they are bored and screaming like hell. The best baby swing should be baby themed. You can choose a car for a baby boy or a pink for the princess. Additionally, it should have an inbuilt music player to excite them with music, a vibrating seat for that extra comfort, and lights to kick the entertainment a notch higher. In coming up with the 10 best baby jumpers for babies, we relied on the parents’ experiences on what they thought about them. We kicked into detective mode and fully immersed ourselves in their sentiments both positive and any reservations they had for the products which formed the cornerstone of screening the jumpers. Secondly, brand reputation was another yardstick. We could have included new players who are seeking to make a name in the baby jumpers manufacturing, but insufficient information and lack of credible backing made us exclude them. We had rather come up with two best with a credible reputation rather than one hundred with a rather shady reputation. Our Editors are aware of the trepidation of child developmentalists vis-à-vis the use of jumpers. However, we simply cannot ignore many parents are still buying these accessories. Many have come out guns blazing to attest that the babies have the time of their lives with these accessories. When it comes to dollar pinching, the Graco Doorway Bumper Jumper, Little Jungle indeed won hands down. It comes at a lower price without compromising on extras that come with its peers. For example, it has one of the most durable springs in the market giving it an upper hand over its peers. This spring has been covered and hidden from the view hence not compromising on the sleek design and also makes sure that it does not pinch your baby’s cute fingers. Kids have pretty nails right? You don’t want them to have a hard time getting that manicure when they grow up. It is also easy to clean the seat pad as it is detachable and can be machine washed. With this possibility, it should be entrenched in the constitution that any parent found with a dirty jumper should be heavily penalized both here on earth and heaven. Best of them all, it can be attached to the doorway or door frame without moving even a razor thick distance as it has a non-slick clamp. Additionally, the straps are adjustable hence it will grow with the kid. Bright Starts Roaming Safari Door Jumper is the fairest of them all! It is more colorful than ever and has up to 12 interactive erudition activities. It is a sort of a baby “kindergarten.” It has cute, lovable toys which constantly keep the baby active by banging them which helps in coordinating and developing the fragile brain. It also comes with 360 degrees rotating seat that makes it snappy to access all the play stations when your baby is spoilt of choices. Moreover, the adjustable strap grows as the baby grows as it is adjusted to suit their height. Lastly, it has a removable and washable cover for hygienic purposes. This compounded by a soft cushion pad makes the baby comfortable head to toe. So there you have it, top 10 baby jumpers on the market. The best baby rocker has first to be liked by the child, not the parent. Hence the saying knowing your canvas before painting determines the ultimate quality of the sketch. Before buying this accessory for your infant, make sure they have been rated safe, steadfast and utterly dedicated to stimulating your baby’s hearing and visual senses, not forgetting their balance and motor skill function. A baby rocker is an excellent way to springboard the movement and development of your baby. At their infant stages, they need exhilarating accessories to keep them pumped and gritty to reach and overcome every milestone. Knowing your canvas before you start sketching ultimately has the final say on how the painting will look like. Consequently knowing what your kid wants determines what kind of individuals they grow up to be. For them to start walking, they need to start slow by using simple things like pulling up or holding down their weight. For these amalgamate to actualize and come to fruition, they need unencumbered leg muscles. We understand your fear of them falling when you help them, but they also need their independence. That’s where a baby rocker comes in. This unmetered firsthand experience without assistance gives room to the little voyagers to test the waters under their feet and feel how the world feels. The best part is that all this happens gradually because baby rockers are configured to work while they are in a suspended position hence the bulky weight is not placed on their minuscule legs at once. Once they are fully accustomed, they start jumping their hearts out which is an excellent route to take in building up their muscles and improving motor skills. And since baby rockers come with straps, they hold onto them while jumping or play with the toys around. Within no time they will be less concerned whether you choose to wear makeup or cook those pancakes to enjoy with the senior members of your family.